Bezircle, the widely-acclaimed strategy puzzle game from indie developer Ludomotion, has at last been unleashed on Android! This news comes after an unveiling at Google I/O last week, where Bezircle was included in the Android TV developer preview showcasing demos from a select range of developers who have adapted their games for the Android TV platform. Developed by hit indie studio Ludomotion, Bezircle is a groundbreaking game with mind-bending complexity, single-player depth and multiplayer mayhem for fans of puzzle and strategy games. 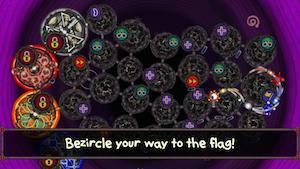 Players can capture orbs by ‘bezircling’ them before their Android-controlled enemies or human opponents to win the level. Capturing special orbs boosts performance and unleashes devastating effects on the arena. Players can adventure through the massive single-player campaign, or share a device with up to four players and compete in an infinite number of multiplayer arenas! Head to Google Play now and download Bezircle for FREE!